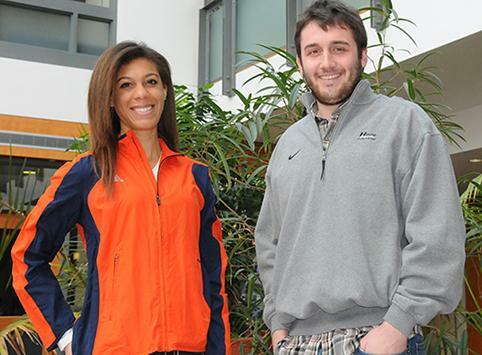 Two Hope College student-athletes have been awarded NCAA Postgraduate Scholarships. Football player Michael Atwell and cross country runner Sheri McCormack are among 58 fall athletes nationally across all three divisions who will receive one-time, non-renewable grants of $7,500. The addition of Atwell and McCormack gives Hope a total of 19 NCAA Postgraduate Scholars since 1974. Mark Northuis, chair of Hope’s kinesiology department, praised the recognition for Atwell, a senior from Geneseo, Ill. (Geneseo HS), and McCormack, a senior from Holland (West Ottawa HS). It is the second time in Hope’s history that two student-athletes received NCAA Postgraduate Scholarships in the same school year. In 1999, current Hope volleyball coach Becky Schmidt was given one for volleyball, while Rebecca Timmer was awarded one in track & field. Northuis also coached McCormack during a decorated cross country career that ended last fall with Michigan Intercollegiate Athletic Association Most Valuable Runner honors and a 17th-place individual finish at the NCAA Division III Championships. She also earned All-America honors. McCormack helped the Flying Dutch finish ninth in the team standings at nationals — matching their second-best performance all-time. McCormack, who’s majoring in chemistry and Spanish at Hope, plans to use the grant toward the cost of University of Michigan Dental School. She was thrilled when she was notified of the award. "I found out about the scholarship during lab,” McCormack said. “The email was completely unexpected, and it was a challenge to contain my excitement." Atwell started at quarterback for three seasons at Hope. He finished third in Flying Dutchmen history with 6,094 passing yards. He threw for 2,582 yards and 20 touchdowns during the 2013 season while leading Hope to a 7-3 overall record and a second-place finish in the MIAA standings. Atwell is majoring in biology and chemistry at Hope. He plans to use the NCAA Postgraduate Scholarship toward the costs of medical school. Both Atwell and McCormack expressed appreciation for the all-around support they received at Hope while being student-athletes. McCormack said competing at the Division III level allowed her to run at a high national level and still excel in her studies. The NCAA awards as many as 174 postgraduate scholarships annually, 87 for men and 87 for women. The scholarships are awarded to student-athletes who excel academically and athletically and who are at least in their final year of intercollegiate athletics competition. Each sports season (fall, winter and spring), there are 29 scholarships available for men and 29 scholarships available for women.